A visual story to share the magic of hand crafting our wedding dresses should you work with us directly at our Fitzroy atelier. It' essentially a dress up session! A trained consultant will present our collection and during the hour appointment we aim to identify your needs and what you are drawn to from our selection. Each gown is individually crafted in our studio above the shop so depending on time, budget, taste and personality we can guide through the permutations within the designs we offer. For instance you might like a beading on one dress, the fabrications of another & the colour of something else. Not everything can be done but we can certainly create a gown that suits your individuality if you choose to. We encourage clients to not bring too many people to this first appointment in fact sometimes coming alone is better. Too many cooks can make the already confusing experience stressful and we want it to be a fun journey. Select guests wisely so you have the head space to edit and digest what feels right without too many opinions. We know it can be overwhelming deciding on a gown so we find most clients need a second appointment. This is a great appointment to bring trusted friends to help with selection. Here clients retry favourites and any gowns that may have been overlooked at the first appointment. Generally this is a time to refine colours and ideas but these can also be decided later should you choose to proceed with ordering a gown with us. If you decide on working with us to make a gown we schedule a measure. This is generally by designer Gwendolynne Burkin herself. At this appointment the dress will be analyzed from top to bottom and the client will be guided on how we can make the design right for them. Basic measurements will be taken and also clarification of any colours and details should you wish to personalize the design further. With over 25 years of experience this is where she can technically and aesthetically guide you with what is achievable and flattering plus problem solve any unique requests. Gwendolynne likes to work with the client she will always advise but fundamentally she is aware it is the clients dress. Gwendolynne will also step through any styling elements and appropriate underwear at this appointment and answer any questions. If you aren't able to visit our boutique and cannot be measured by us we can guide you here. Depending on your selection, Gwendolynne might present design solutions with sketches . This is generally with clients requiring a custom gown. An appointment can be made directly with Gwendolynne to explore alternative ideas to what is in the collection's offer at the designers hourly rate. We encourage clients to be guided through our collection during a complimentary consultation with our sales consultants, for the first phase of refining ideas and then if they are still keen to meet with the designer this can be cordinated. Please contact us for rates on this service. All our embellishment designs are created exclusively for the label inspired by architecture and patterns with the designer's immense imagination. They are not a length of cloth developed elsewhere and cut into. Should you select a design with beading it will be individually hand beaded for your order. Some of our designs are proportionally manipulated by computer for orders (this is generally for our beaded dresses, not for designs with collar placements). Clients who have the time can explore alternative options and alter most of our beading designs. If requested, we can create a small motif (for a fee) before we proceed for piece of mind. Gwendolynne works closely with a French trained hand beader to perfect her unique embellishments choosing each bead, colour and thread with precision, to the designer it is her art. For orders we outsource this part of the process to keep the gowns affordable for our clientele. We have been working for over 15 years with a high end artisan company who make for the couture collections of the likes of Balmain, YSL. Marni, Valentino, Chloe, Oscar de Le Renta and Dior. As much as we would love to do this part of the process in house it can take 4 days to create a 10cm X 10cm piece of our embellishment so it is impossible to make hand beading affordable for our clients in our studio. With the measurements taken at your measure we draft a bespoke pattern to cut your gown. Gwendolynne Burkin's background working as a pattern maker makes her passionate about the fit of a garment and a dress that is precisely cut to a clients proportion is the most flattering. Our process also allows assessment of a clients measurements closer to the date of her wedding so the garment fits impeccably. The effortless liquid aesthetic of Gwendolynne designs means the cloths must be cut with care. Unlike mass production fabrics, beading and laces are cut with slowly and individually in the couture process for many reasons. A made to measure garment requires more precision to ensure fit, to ensure patterns in beading and lace are symmetrical and the fluid nature of the beautiful silks in the Gwendolynne designs involve time and care as they easily move whilst cutting. Each gown is sewn in stages. The liquid cloths must also be sewn slowly with care to ensure the seams sit perfectly. The gowns are not sewn in a mass method and each seamstress is broadly skilled in the construction of gown making. We also French seam our gowns, which makes seams in sheer fabrics look beautiful. The first fitting is the basic foundation of the design selected. 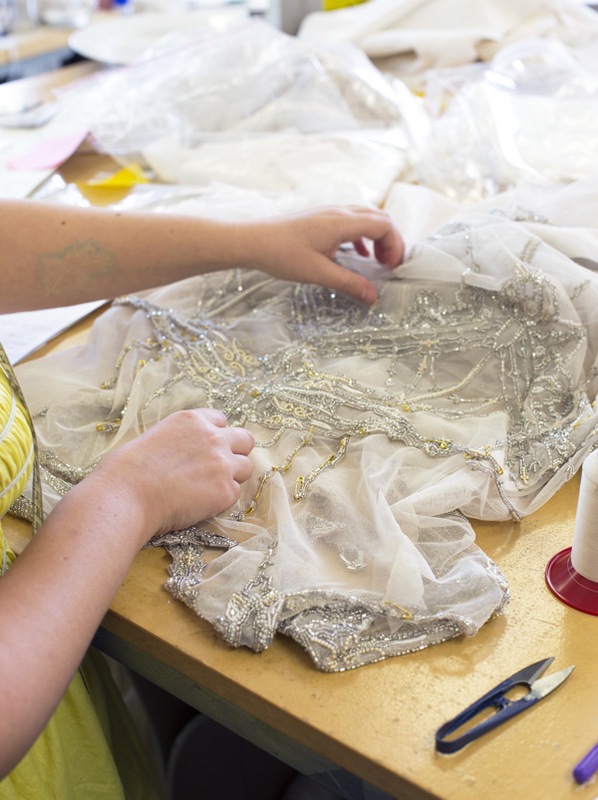 This allows us to approve the pattern before we go into more of the complex stages of the gown manufacture. Generally this is the base of the garment without any of the overlay treatments. If you have selected a design with beading we like to have that ready for the first fit too so you can visualise the total look. This stage can be confusing and isn't the most flattering part of the process but is crucial; like the foundations of a house as we can get the structure perfected before we put the windows and doors on! Some would call this a toile which is traditionally done in calico however we use the fabrications of your gown for a much more accurate fit. We adjust one side of the garment only and between the fittings we balance the two sides & approve it at your next fitting, plus track your measurements. It's maths! as we draft your pattern and work out the draping on your bodice. The gown is assembled further for a second fitting. If there is any hand draping this is usually applied at this stage and the design is much easier to visualise! The lining will not be in yet so we can easily access any further adjustments. This is a good fitting to bring guests. Areas that are adjustable such as the back, straps etc are still left open and/or saftey pinned together. This allows for body changes, an assessment of the look and also to double check details as much of the gown must be pulled apart and re made to get to this second stage. At this point it is ascertained if more adjustments to your pattern will be made depending on your size and to your approval with a consistent aim to ensure the gown sits to your satisfaction. We work with small fine saftey pins to secure highlight embellishments and laces in the first stages of fitting your gown. Simply so they don't fall out! Here clients might like to look at accessories and veils so it's a good idea to really have thought about your hairstyle to compliment these accessories and shoes by this fit. We schedule a fit check one month before a clients wedding to review measurements before we complete the gown. This is also aligned with your cycle so if you are inclined to fluctuate monthly it is telling of how you shall be on the day. Here we mark out trains and hems to complete the gown, so it's essential clients have their shoes for this appointment. This is also aligned with the wedding day and cycle so it is close to what measurements should be on the day. We analyse measurements which we track over the course of crafting the gown and discuss how the gown is to fit at completion. Between fit check and pick up all the hand finishing is completed such as buttons and loops and the beading is hand secured down and a final press. We coordinate pick up two weeks before the event. This can vary depending on where a client lives, wedding location, pregnancy, health, weight loss, etc. We schedule this during the working week for full focus in our shop as Saturdays are too busy. Also our sewing team are on hand should there be any last minute adjustments required. At this appointment you get to walk around and test the train & we double check everything is to your satisfaction. So our clients have their gown and it's time to marry their love... We are ALWAYS thrilled to see our clients wear their Gwendolynne gowns on such a treasured day in their life. The favourite part of our job is seeing photos of our real brides at their wedding. We have tips for care just in case you're having too much fun and red wine befriends your gown & other things unthinkable things that might happen. But what's most important is you have fun. We make our designs upstairs from our boutique in Fitzroy, Melbourne. As they say magic is in the mess so here is our light filled workroom where Designer Gwendolynne Burkin works intimately with her team. She quite likes to work late so you can often catch a glimpse of her through the window upstairs at night. "Sometimes I just like the creative flow of night. I can spread out on the table pump up the music and really get creative. It's why I do it in the first place cause I simply love making things" says Designer Gwendolynne Burkin. We are proudly Australian Made and treasure keeping the rare hand crafting skills alive in our small business. If you ever want to see our studio when visiting we are always proud to show the space. And don't forget for weekday appointments we are busy upstairs making beautiful gowns so you'll need to come around the back and press the buzzer. We really look forward to meeting you & sharing our world!